Munster made light work of Castres in Limerick. 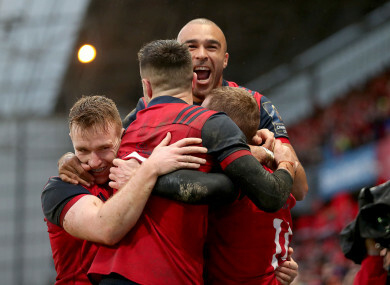 THESE MUST-WIN SCENARIOS only ever tend to bring the best out of Munster, and so it proved as they produced a clinical and ruthless performance to safely book their place in the Champions Cup quarter-finals for a record 17th time. The three-hour delay to kick-off may have heightened nerves around these parts, but it only served to focus Munster minds as they swept a horribly indisciplined Castres outfit aside with minimal fuss to book a mouth-watering quarter-final date with Toulon at this ground. Six tries, five of which came during a dominant second period, ensure Johann van Graan’s side not only top Pool 3 but will have home advantage in the knockout stages. Although the visitors started intently, drawing first blood from the boot of Rory Kockott, they rolled over meekly in the Limerick rain as Munster’s dominance up front and accuracy around the fringes ensured the outcome was never in doubt. From the moment Keith Earls dived over in the far corner, Munster were comfortably on their way and the only question was whether it would be La Rochelle or Toulon visiting Limerick in April. Second-half tries from Rhys Marshall, a penalty try, Simon Zebo, Alex Wootton and James Cronin ensured the southern province collected all five points to set-up a clash with the three-time winners. It also means Munster are on the opposite side of the draw to Leinster and will face either Clermont or Racing 92 in an away semi-final if they can produce another rousing performance against French opposition. Castres, in conceding 18 penalties and having two men sent to the bin, made it easy for Munster and a result of this significance will come as a welcome relief to the province after two difficult weeks off the field. They were home and housed by the hour mark and had their supremacy up front, most notably at the set-piece, to thank for what turned out to be a comfortable afternoon’s work. That said, Munster were a little slow out of the blocks, although were at least solid and disciplined in defence as the visitors started with plenty of purpose. Zebo’s handling was tested twice in the early stages and then Peter O’Mahony relieved the early pressure with a trademark lineout steal after Stephen Archer had pulled down a Castres maul. The French side were full of hustle and bustle but lacked a cutting edge until centre Robert Ebersohn brilliantly scythed through a congested midfield channel and had Munster scrambling, with Earls forced to make a covering tackle inside his own 22 before Kylian Jaminent fumbled. Munster exerted their dominance at the following set-piece but after winning the scrum penalty, Jean Kleyn needlessly sparked a heated tête-à-tête with Antoine Tichit, and Ben Whitehouse reversed his decision. Incensed with the referee, a small number of patrons had to be reminded of the long-standing tradition of respecting both kickers, before Kockott knocked over the penalty for a 3-0 lead. Castres’ advantage didn’t last long, however, as Munster got ball in hand for the first time and hammered away around the fringes with a mixture of direct, hard and precise carrying. The visitors conceded two penalty advantages in one sequence, for Keatley to draw his side level from in front of the posts. Munster lost Dave Kilcoyne in the preceding passage of play as he hobbled down the tunnel to be replaced by Cronin, but the replacement loosehead was rock solid in his first scrum to win a huge defensive penalty as Castres’ front row collapsed. Van Graan’s side continued to hold the upper hand up front and a big shove, this time in the opposition 22, won the turnover penalty. Murray took it quickly to chip through for Zebo and Andrew Conway, but both were ahead of the ball and Whitehouse pulled it back and ordered a retake, with Keatley pointing for the posts for a 6-3 lead. Castres’ indiscipline continued, conceding penalties for a myriad of infringements on the ground, and it allowed Munster gain a stranglehold. Ebersohn was given a warning, but his team failed to take heed as they illegally halted Munster’s momentum and charge for the line again. After a surging rolling maul was grounded a metre short, Chris Cloete and then Murray put the head down and darted towards the whitewash while the muddy surface wasn’t conducive to Conway’s attempts to dance inside two tacklers at pace. Whitehouse eventually brought it back for the penalty advantage in front of the posts, sent centre Thomas Combezou to the bin and Munster turned the screw with another scrum. Murray tapped quickly again and Keatley and Zebo combined to send a bloodied and bruised Earls over in the corner. After a bright start, Castres had completely lost their way and another poor kick-chase very nearly resulted in Munster’s second try. Keatley gathered the loose ball in midfield, Rory Scannell moved it wide with a superb tap-on over his shoulder for Chris Farrell to slalom through the gaping holes. The centre had support on his shoulder but after linking inside with Murray, the scrum-half reversed it back for Conway — who wasn’t expecting the pass and knocked on — when he could have carried it on himself. Chance lost, but it only took four minutes of the second half to register try number two. Castres were off their feet, Keatley pinged it into the corner and the forwards did the rest as a compact and powerful maul allowed Marshall collapse over the line. From there, the only question was whether Munster could find two more scores in the remaining 35 minutes — and, if truth be told, if it was never really in doubt. Castres continued to offer up penalty-after-penalty, and Munster, although briefly frustrated having had two scores chalked off, happily elected for a series of scrums which would eventually lead to Whitehouse awarding a penalty try under the posts. Earls thought he had crossed for his second in the left corner on another advantage but play was pulled back for a forward pass and then Murray picked and went himself from the base of the five-metre scrum before pirouetting out of the attempted tackles, only to lose control of the ball in the act of grounding. Two minutes later, Whitehouse finally went to his pocket to send tighthead Daniel Koetze to the bin and from the resulting penalty scrum, the Castres front-row failed to drive straight and Munster were within sight of the bonus-point. They wasted little time in securing it, as Earls showed great awareness to stay in play while fielding a clearing kick from Julien Dumora before brilliant footwork and acceleration created the space inside and he set Zebo away with a perfectly-timed offload. The fullback did the rest, bursting through two tackles to seal the clinching score in style. With the game won, Van Graan unloaded his bench and Wootton marked his introduction with the fifth try as he wriggled past a mass of bodies to finish from close range and then Cronin rounded off the scoring at the death. MUNSTER: 15. Simon Zebo, 14. Andrew Conway, 13. Chris Farrell, 12. Rory Scannell, 11. Keith Earls (Alex Wootton 62’), 10. Ian Keatley (JJ Hanrahan 65’), 9. Conor Murray (Duncan Williams 69’); 1. Dave Kilcoyne (James Cronin 17’), 2. Rhys Marshall (Niall Scannell 48’), 3. Stephen Archer (John Ryan 42’), 4. Jean Kleyn, 5. Billy Holland (Darren O’Shea 61’), 6. Peter O’Mahony (captain), 7. Chris Cloete (Jack O’Donoghue 65’), 8. CJ Stander. CASTRES: 15. Geoffrey Palis (Afusipa Taumoepeau 60’), 14. Kylian Jaminet, 13. Thomas Combezou, 12. Robert Ebersohn, 11. David Smith, 10. Julien Dumora, 9. Rory Kockott (Yohan Domenech 72’); 1. Antoine Tichit (Tudor Stroe 46’), 2. Jody Jenneker (Kevin Firmin 47’), 3. Damien Tussac (Daniel Kotze 53’), 4. Alexandre Bias, 5. Thibault Lassalle (Victor Moreaux 46’), 6. Yannick Caballero, 7. Steve Mafi, 8. Alex Tulou. Email “Munster blow Castres away with rousing Thomond performance to progress ”. Feedback on “Munster blow Castres away with rousing Thomond performance to progress ”.